The Atlantic Harp Duo was unexpectedly reunited in Paris, during the month of November, due to massive flooding in the Bangkok area. A meter of water covering the area where Elizabeth has been living and working—at Mahidol University—displaced her from her home for six weeks. The duo took advantage of being together to put on a benefit concert to raise money for the flood relief efforts. The concert took place on the 20th of November, at the Espace Camac in Paris. The house was full—100 audience members. 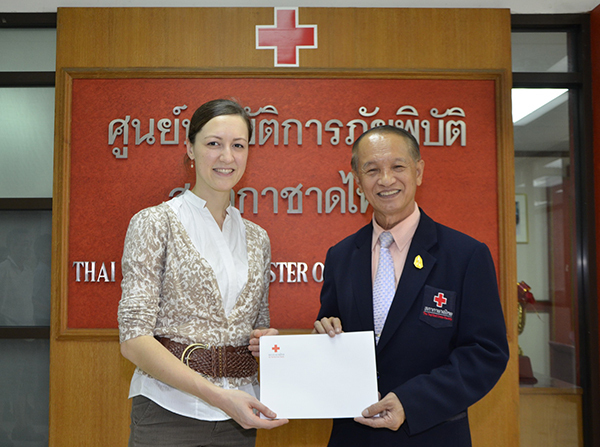 Thanks to the generosity of those in attendance that night, the duo raised almost 600 euros (more than 22,000 Thai Baht), which they donated to the Red Cross Society in Thailand. Elizabeth poses for a photo with the director of the Red Cross Society, in Bangkok. Elizabeth is now safely back in Thailand, where the flood waters have finally receded, and life in the Bangkok area is returning to normal.